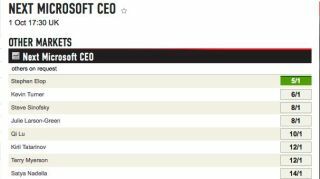 The bookies are weighing in on who will be the next CEO of Microsoft, turning what may be a boring corporate dance into a boring corporate dance with money on the line. Ladbrokes, a U.K. gaming and betting enterprise, laid out the odds of who in the tech world has the best shot at taking over for Steve Ballmer. The most likely? Nokia CEO Stephen Elop at 5/1. Steven Sinofsky is third at 8/1, while Reed Hastings, CEO of Netflix, is 16/1. Marissa Meyer calls in at 33/1, and Facebook's Sheryl Sandberg and Sir Jony Ive are 40/1. The least likely? The old Softie himself Bill Gates has a 50/1 punch, though he's beat by Apple CEO Tim Cook at 100/1. We suppose stranger things have hap...no, that would be too strange. Blips are always a safe bet.